Our newest clear filter, the Brilliant Clear Protective Filter for Canon Cine-Servo 17-120 is designed specifically to fit and protect the front element of this rather expensive lens, which retails for about $25,000. Using this lens without a Clear Protective Filter risks damage to the front element of the lens. Front element repair on this lens is quite expensive and the lens is unavailable for use during the repair, which may be more expensive than the repair itself. Canon designed this lens with a very special filter mounting and until now options for clear protective filters were quite limited and expensive. Ordinary 112mm filters don't fit perfectly. We've designed our filter to fit perfectly on the lens and once it's on, the original Canon lens hood fits nicely on top of our mounted filter. It's important that any filter for a professional cine lens should maintain the image quality, even at the longest focal length. To do that, a filter needs to be very flat and have a very fine anti-reflection coating. Today I had one of these filters on our Phase Shift Zygo Interferometer to measure it's flatness. It's quite important the filters used on professional lenses are flat . . . really flat. We test our filters to ensure that they're flat. It's important to know that the Zygo is measuring our filters in transmission. A laser beam expanded to a 4 inch diameter is shot out of the front of the Zygo through a very flat "reference flat". The beam then goes through our filter to a very flat mirror and is reflected back into the Zygo's camera for analysis. The Zygo merges the reflected beam from the reference flat with the beam that returns through our filter and creates "Interference Fringes", which describe the shape of the filter being tested. In the old days, an optician would look at these interference fringes and mentally calculate the shape of the glass from the shape of the fringes. Fortunately for me our very advanced Zygo phase shift interferometer uses a camera to capture the images and the Zygo MX software analyzes the measurements, producing a 3D surface map and numeric results. Here's an image of those interference fringes from our test today of one sample of our 112mm Clear Protective Filter for Canon Cine-Servo 17-120. 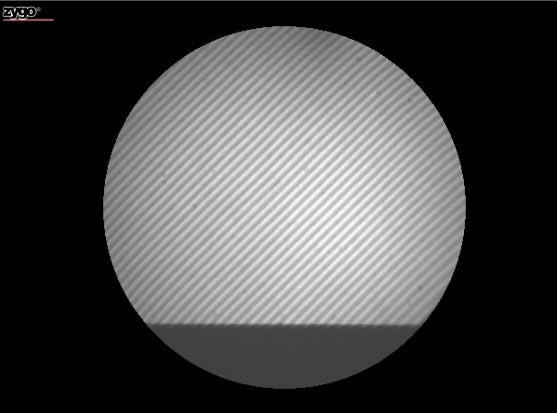 You'll see that the fringes are obscured at the bottom of the round filter image by the holder the filter rests in. This isn't affecting the flatness results. We can and do rotate the filter to ensure that the obscured portion matches what we're measuring here. Note that the fringes are straight and parallel, that's a very good thing. The image below is the 3D model of the surface that the Zygo built using the fringes shown above. The shape of the surface is exaggerated so that you can see small errors. When you're sitting at the Zygo you can rotate and examine that image. Looking at the image you can easily see that the filter is not flat. The question is only: Is it flat enough? In the upper left of this image you see the numeric values, which in this case shows a "Peak to Valley" departure from flatness of 0.453 λ (Greek Lamda = wavelength) and an RMS value of 0.097 λ. The RMS value (Root Mean Squared) is a statistical analysis of the shape of the filter and is a more useful single number than the Peak to Valley value. So the Peak to Valley flatness between the highest and lowest points of the filter is less than half a wavelength of light. The RMS value is less than 1/10 of a wavelength of light. It's clear that this filter, like all of our filters, is extremely flat. OK, now I feel the need to expand on the term I used a moment ago: "transmitted wavefront". Transmitted wavefront is a way of describing the light passing through an optic. If both surfaces of the filter are precisely flat, we get an excellent transmitted wavefront. We don't however actually need both surfaces of a filter to be precisely flat, what we need is for the filter to not disturb the images made with excellent cine-lenses. As long as the front and rear surfaces of the filter are nearly flat, but precisely parallel, the filter appears perfectly flat to the camera lens. The filter is said to have a flat "transmitted wavefront" and will not degrade an image, even when used with long focal length telephoto lenses. Our filters are ground and polished on "double sided lappers". Think of the filter being ground between two granite mill stones. With one stone on top and one below, the filters are ground (and later polished) on both sides at once. The net result might well be that each surface is not precisely flat, but the two sides are parallel. 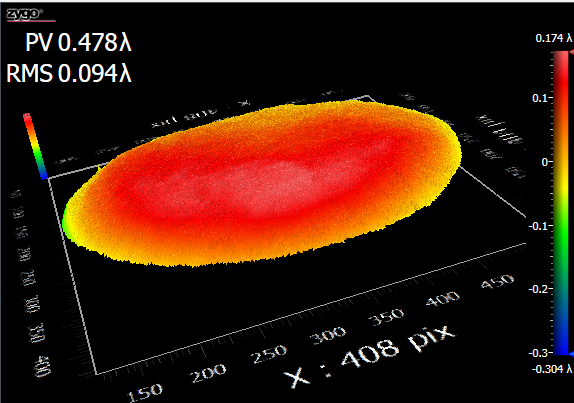 This results in a filter with a flat "transmitted wavefront", which is what we're measuring on our Zygo interferometer. Our Clear Protective Filter for the Canon Cine-Servo 17-120 has a Broadband Multi-Layer Anti-Reflection Coating on both sides. This is often called "MC Coating". A cheap uncoated filter will reflect 4% or more per surface. Our Filter with Broadband AR Coating reflects less than 0.5% per surface. I hope you've found this discussion useful. If you have questions, drop me a line or call our office.